Early in my college life, when I was just beginning to find my way with a camera, I subscribed to a photography book-of-the-month club. 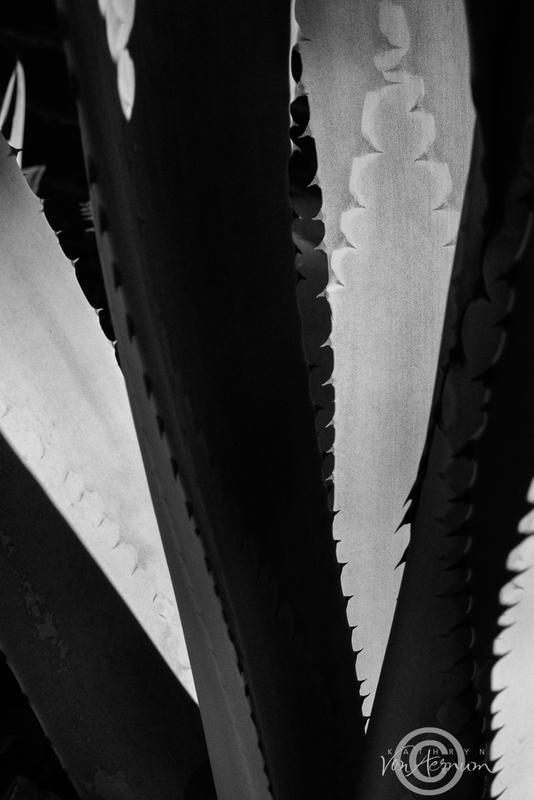 The very first book I received was Imogen Cunningham – A Portrait by Judy Dater. Imogen was one of the pioneers of modern photography, who along with her Group f/64 fellow photogs, Ansel Adams, Edward Weston, Sonya Noskowiak and others elevated and solidified photography as a fine art medium equal to its creative counterparts painting and sculpting. 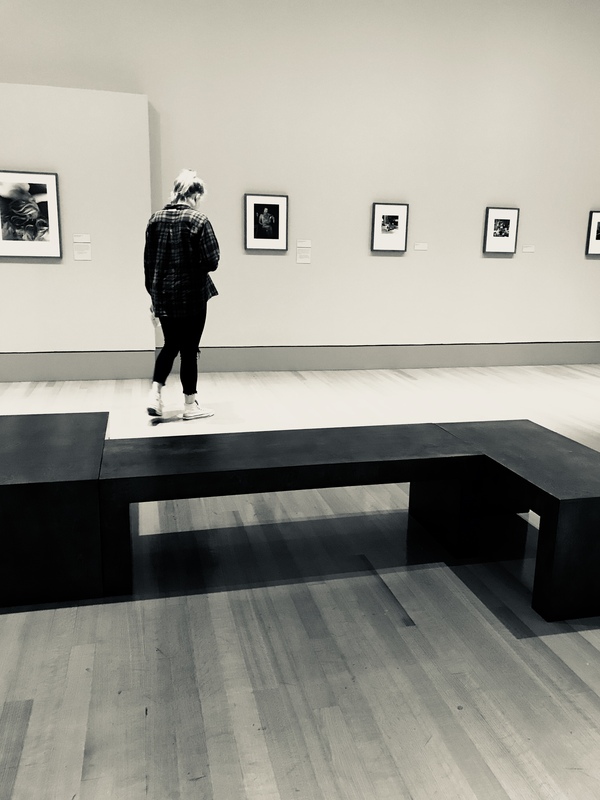 This past Wednesday, my dear friend and fellow creative, Sonya and I had an impromptu artist date to catch the Imogen Cunningham exhibit “Seen and Unseen” currently on display through April 29 at the Columbia Museum of Art. The size of the exhibit is impressive. While I didn’t take an official count, there seemed to be at least 50 images spanning the length of her career, which ranged roughly from 1907 – to the late 1960’s. If you have any interest in photography, this is a do not miss show. If you are a fan of black and white photography, this is a do not miss show. 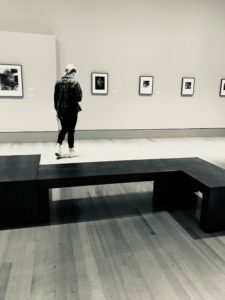 In this age of image overload from social media, it is a rare treat to slow down, to be in a quiet space and look at expertly printed photographs, hanging in a museum, from a pioneering master of the medium. 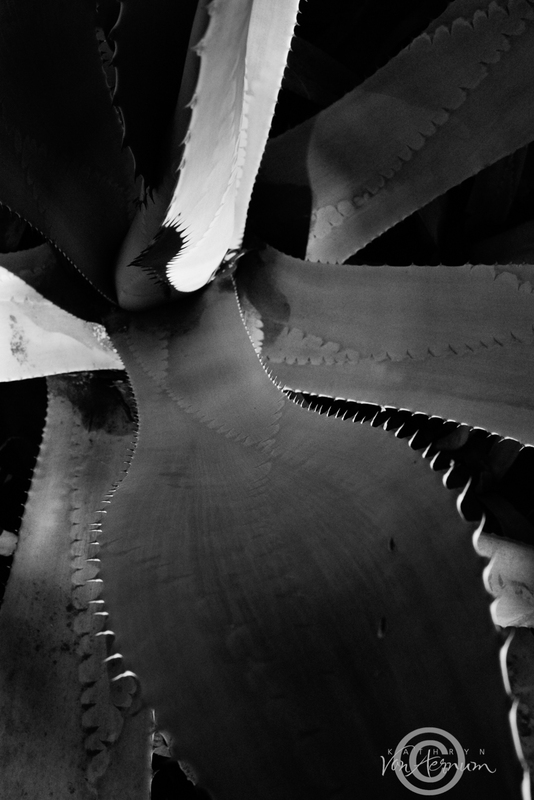 Imogen is known, in part, for botanical imagery on par with O’Keefe’s sensibilities. She pre-dates Annie Leibovitz for striking celebrity portraits for Conde Nast publications and she also loved to create “stolen photographs,” taking pictures of unsuspecting subjects without their knowledge. She is a woman after my own heart. I also love to do this – especially in a museum. 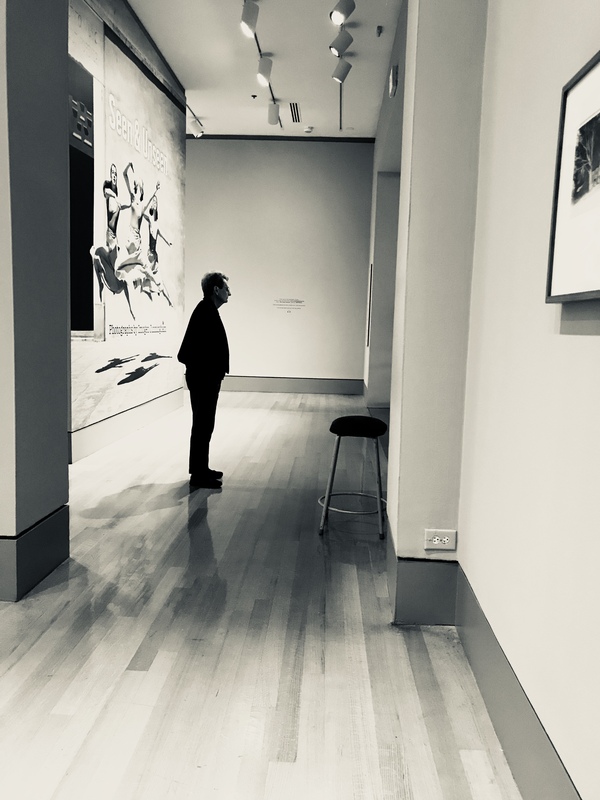 I have often said that if I could make my living just taking pictures of people in a museum (or a library) I would be very happy. I’ve included a few stolen photographs inspired by my museum visit. For a little tech talk. Where Bokeh (the amount and quality of background blur) and wide open apertures are stylistically prevalent in photography today, during Cunningham’s time having everything in sharp focus was the standard, hence the Group f/64 name. I can’t imagine a lens with a rating of f64! With all of the filters and gadgets to manipulate our images, it is humbling to think that very little manipulation was employed in her photographs. 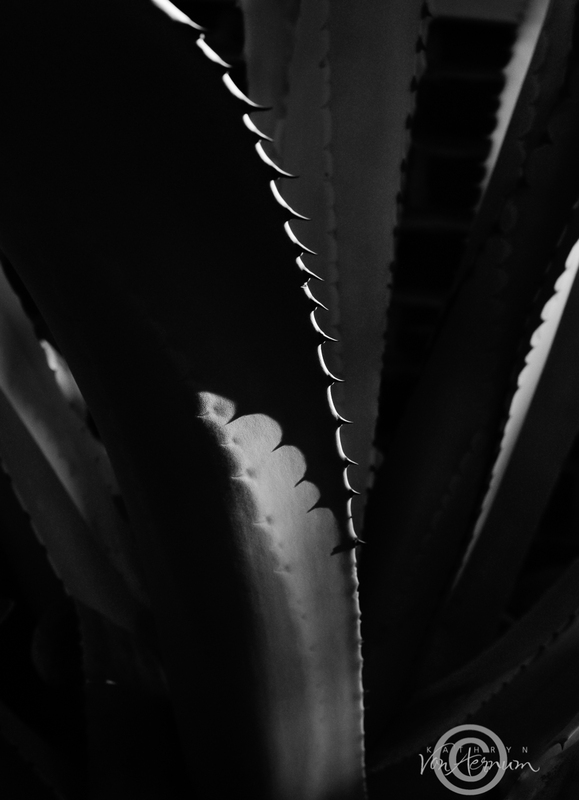 Today, still inspired by the exhibit and the morning light illuminating a century plant in my yard, I got my camera and set it on f16 – the smallest opening for my 50mm 1.8 lens. At the close-up range I was shooting, it is impossible to have everything in sharp focus, but nonetheless, I worked with what I had. I set the meter to spot and read off of the highlights to underexpose the background. The only manipulation here was to convert to black and white and to boost the contrast slightly. I have tried to photograph this plant many times and have not been happy with the results. Thanks to the inspiration of Imogen, I came much closer to something that satisfied me! It’s a great exercise. Which one do you like the best, I’d love to hear from you. I’m so glad all those years ago I ordered that book. I know longer have it due to multiple moves in my life. It was a first edition and now a collector’s item. If you are in Columbia go see the exhibit. While you’re there, check out Renée Cox: Soul Culture for a very different approach to photography.